Solgari is at the centre of the cloud software revolution transforming global business communications. Not since Alexander Graham Bell’s invention of the telephone in 1876 has technology unleashed such a huge change in how companies are communicating. The 150 year old communications industry is currently being massively disrupted by the movement from hardware to integrated cloud based software. For years, businesses around the world have been putting up with the pain and costs of disjointed, unintelligent communication systems. But the cloud has changed everything. And this is where Solgari has developed our vision of offering a fully integrated omni-channel cloud communications software service. 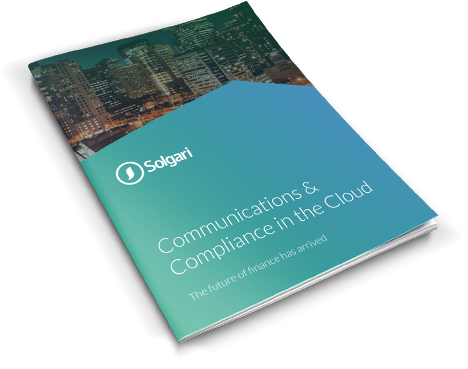 Today, Solgari powers all our customer's digital communication channels - voice, video, chat & SMS - while automatically addressing all related regulatory compliance requirements around GDPR, MiFID II and PCI DSS. Our customers use whatever services they need through any device that connects to the internet, avoiding the need for expensive, disintegrated hardware, software and carrier solutions. Our customers enjoy a huge leap forward around business intelligence and productivity while removing or avoiding significant old world communication costs. The future of business communications is here. Led by a team of driven entrepreneurs building a market disrupting cloud software business. Solgari's leaders have particularly strong knowledge and expertise in the fields of technology, financial services and corporate finance. We are applying decades of experience with Level 3, Texas Instruments and Citi along with the invention of integrated communications software to revolutionize business communication services globally. A dynamic, experienced hand at the helm. John is recognised for his software and services innovations, having already built several successful enterprises. John has over 30 years’ experience in the IT industry in a variety of roles, moving from engineer, to developer, to marketer, to strategist to CEO. John has been a leader in Level 3 Communications, Orygen and Texas Instruments. He is also an IMI/Cambridge University business mentor to several high growth technology companies. World class telecoms engineer, cutting edge cloud architect. Deep SaaS corporate finance expertise, focused on the detail. Ed has over 20 years of experience in technology, private equity and corporate finance. A graduate of University College Dublin and the University of Regensburg, Ed spent 10 years working in corporate & investment banking with Citi in Dublin, London and Paris, covering the Technology, Media and Telecoms sectors. Ed subsequently moved into private equity with a particular focus on SaaS leading to the launch of Solgari.